Exposure to numbers doesn’t have to be formal and serious. Even silly experiences can be full of learning! Learning about numbers is one of those foundational concepts, necessary for understanding so much about the world. For this reason, we diligent parents are eager to ensure that our tykes are on-track for numeracy skills from the very start. These ideas, for the crowd that isn’t quite ready to write numbers or study formal math, will build a foundation for later success–without the need for any formality or structure. Make counting a regular part of your life, from how many baby carrots your child wants for lunch to how many strokes it takes to mix your brownie batter. The more opportunities you take for counting (within reason, of course!) the more familiar your child becomes with numbers and their order. Master the “concept” of number. Talk about how many cups you’ve stacked, how many blocks are in a line. Help your child develop a mental image for each number—especially for 1-5. Compare groups of items. Line up all your red Hot Wheels and park the black ones in a row beneath them. Decide which group has more, and how many more there are. Have fun with simple word problems. “Look, you have five grapes left! How many will you have after you eat another one?” In this way, your children will learn that numbers and math help them to describe and understand their world. As your child ages, “their” number is infinitely special to them. On each child’s birthday, I make a sign saying, “[Kid] is [#] today! Happy birthday!” This sign starts prominently displayed in the kitchen, but after a week or so it moves to their bedroom, where it hangs all year. If nothing else, my kids master recognition of one number each year! Point out numbers in your child’s world. Count down that last minute on the timer until the cookies are done, talk about the price of items you’re buying at the store (as you point to the numbers on the price tag), inspect the page numbers of the books you read. Start to nurture familiarity with the written symbols we use for numbers. Post a number line or 100 chart for your child to ponder. Show them how it’s organized, and refer to it when numbers or comparisons arise. They may love to count while pointing to each number—but if they don’t, that’s fine, too! Combine an understanding of number order with some fine motor work: get simple dot-to-dot pages for your child to complete! When they’re interested, play a matching game. Place groups of objects on the floor, a different number of each. Give your child a set of number cards (marker on a blank index card or bit of scrap paper works great), and help them match each number to its corresponding group of objects. Here’s another matching game: Place the number cards on the floor, and see if your child can create an appropriate group of objects for each card. Using Uno cards or homemade number cards, have your child try to put the numbers in order. Be sure to reinforce the left-to-right order they’ll use for reading! Read fun number books. A search of your library’s catalog is sure to turn up at least a handful of colorful or silly counting books. If you’re like me, occasionally you’ll notice that your kid is a real whiz at some things, but perhaps a bit weak in other areas. Last fall I was noticing that Peatie, who was doing great at gross-motor and imaginative stuff, seemed to be frustrated by fine-motor tasks. In order to help him out, I brainstormed activities that develop fine-motor skills. With the goal of fine-motor development at the forefront, I encouraged the kids to participate in at least a few of these activities each week. While we’re not perfecting our cursive (or even buttoning our own buttons yet), I have seen a distinct improvement. Whether you’re traveling to visit relatives or headed for a vacation hotspot, the drive is often the most dreaded portion of the trip. While I haven’t done nearly as many road trips as I’m sure some of you have (both sets of grandparents, at least, live nearby), we have taken several trips with little ones. I’ll break my observations into two parts: Things to Consider and Activities for Travel. Kids have a limited ability to sit, even if you DO bring every toy you can fit in the car. For my children, two hours was the maximum amount of time they could sit contentedly; at three hours we had weeping and gnashing of teeth. Plan your rest stops wisely. If there are long stretches of open road, you’ll need to anticipate when your little travelers will need to stop for food or a potty break; if towns are sparse, you may have to stop at an inconvenient time—but that’s better than driving a half-hour (or more!) with a little one who is not only sick of driving but also HUNGRY. On a related note, little bladders are not always convenient in their timing; plan accordingly. We took a small potty along in the car (and bags to contain smells). This is also handy when the public restrooms you find appear not to have been cleaned since the Cold War. 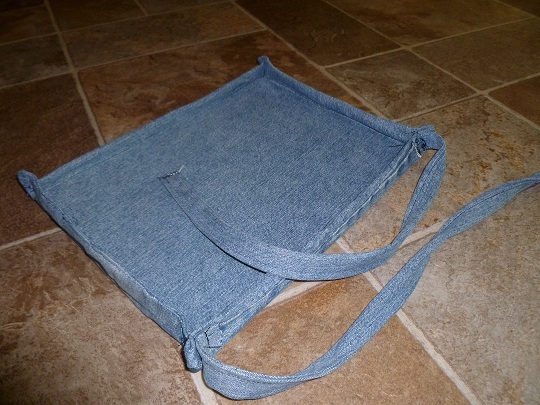 My snazzy, soft, slightly-sloppily-made lap tray, created from a thick sheet of craft foam and the leg of an old pair of jeans. have to plan your meals very carefully. Pack carefully. Consider what you’ll need along the way, and keep it convenient. If you’re traveling with a baby or toddler, keep their bag of toys (and snacks) at your feet so you can dole out new treats at your discretion (rather than having them upend the whole bag on the floor in the first five minutes of the drive). Snacks are an additional form of entertainment. Keep them reasonably healthy, and you won’t even feel guilty about letting your kid have a few more than normal. Easy-to-pack items include pretzels, dry cereal, raisins, bananas, and granola bars. Caveat: The official rule is that kids shouldn’t eat in the car due to the danger of choking. I choose snacks based on my child’s age, and I don’t feed a rear-facing child unless an adult is sitting in the back watching. Please use care. 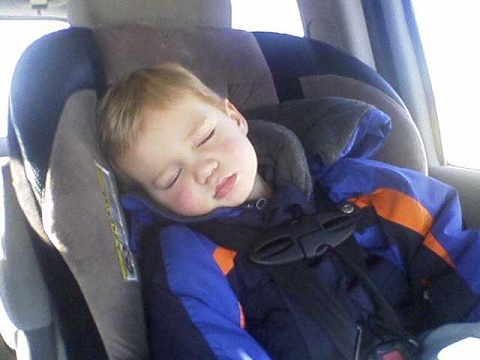 Little Peatie dozes in the car. Every parent of young children hopes desperately that their child spends a good portion of a long trip sleeping peacefully. If you want that to happen, providing the proper accessories (a favorite blankie or stuffed animal, a little pillow, comfy clothes or jammies) certainly can’t hurt. Since your child isn’t likely to sleep for the entire trip unless you’re extraordinarily lucky (ours hardly slept even when we left at 2 am), you’ll need to consider other activities for passing the time. First I’ll state the obvious: electronics. Lots of folks have handheld gaming systems. Anyone with an iPad or similar toy knows that there are hundreds of cheap or free apps for kids of all ages and interests. I, sadly, have no nifty electronic gadgets—but for our longest trip, my Dad was kind enough to let us use his iPad and download some free apps for the kids. Beyond that, there’s the portable DVD player that many parents laud as a lifesaver for travel. Cars and trains: Your kid may not have a lot of space, but they’ve never let that stop them before, have they? The little lip on the lap tray helps keep the cars from easily rolling to the floor and becoming a source of distress. 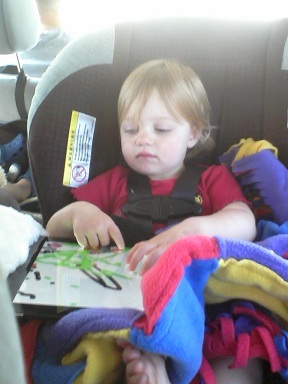 Goobie tests out a free scribbling app on Grandpa’s iPad. decide that coloring the car is a good idea. Then you may want to look into Crayola’s Color Wonder paper or stick to a MagnaDoodle. Tangrams: You can make your own, as I plan to, using sheet foam or even an old cereal box. Plenty of patterns are available online (and this is a great learning tool)! Think of old finger plays you did as a kid (or learn some new ones before you go). 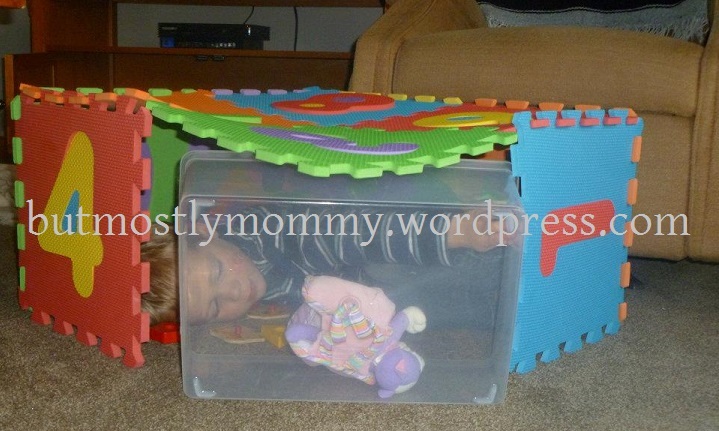 Little ones can enhance their dexterity by trying to copy your movements. Have your kids enhance their fine motor skills while they play. Make your own crazy “dress-me” type creation with the front of an old pair of jeans (zipper and button) plus some Velcro, a snap, a large hook-and-eye, and the like. 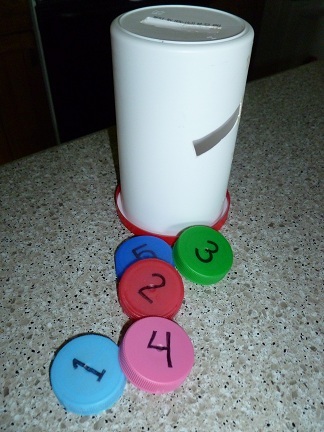 Create a travel-size slot sorter from an old frosting container and some milk lids. Make a lacing card by drawing a shape on the inside of an old cereal box, using a hole punch to mark every inch or so around its perimeter, and hunting up an unused shoe string to go with it. I made this slot sorter from an empty icing container and some milk lids. Are your kids old enough to enjoy books-on-tape…er…CD? Check out some fun ones from your local library before heading off on your trip. Bring some favorite music along. A calming CD can help facilitate nap time, while upbeat sing-alongs can distract cranky passengers—especially if you can get them doing hand motions to the music. Feeling adventurous? Try passing the time by learning the basics of a new language with your little one. You can both giggle while trying to wrap your tongues around new sounds. Go through the rainbow and try to find things of each color along your route. Give everyone a chance to find as many things of each color as possible. Look for letters and numbers as you drive. You can look for them in order, or just ask your kids to spot them at random. I’m sure there’s more I’m forgetting, but this post is plenty long already, and this should be plenty to get you started. Happy traveling! What are your time-tested travel tips?